The UK is the newest destination added to the China-Europe rail link. The train, as of the moment, is being operated as a test train. London is one more international connection for the InterRail Group, along with Duisburg, Madrid, Afghanistan and Riga, on the “One Belt-One Road” corridor. This project is an initiative of the Chinese government. On January 18, 2017, London became the 15th European city to be linked by trans-Asia rail intermodal land bridge services with China. The latest Sino-Europe service – and the first for the UK – is operated by Swiss-based InterRail Group, on behalf of China Railways’ affiliate CRIMT. It left Yiwu station carrying containers filled with clothing and other “High Street “goods on January 2, and arrived in London Barking on Wednesday, January 18. The train had two gauge-break container transfers, where the containers were transferred to the third set of wagons on European standard gauge and hauled by PKP Cargo to the German rail border. DB Cargo AG moved the train across Germany to the Belgian border – where the train was picked up by SNCB Logistics – which ran through Belgium and France to Calais. DB Cargo UK took over from Fréthun via the Channel Tunnel and HS1 to its London “Eurohub” in Barking. DB Cargo UK confirmed that, for this launch service, all the containers loaded in China were bound for the UK. The service is expected to run weekly to assess customer demand and economic viability. The rates for this route are said to be half those of airfreight, and journey time is half that of sea freight, so it just might work. Around 20 of these trains stop in Duisburg, Europe’s biggest inland port. For this occasion, the stop in Duisburg was a technical stop, necessary to transfer the containers to the fourth set of wagons that are approved for Channel tunnel use. Looking forward, however, if the China-London service proves to be a success, DB Cargo is considering using Duisburg as a more general container exchange hub. Containers from China bound for continental European centers could be taken off and replaced with containers from European centers bound for the UK. This could increase the competitiveness of Channel Tunnel intermodal for Germany-UK and Italy-UK traffic flows. DB has collaborated with partners since the start of the decade to operate weekly container trains on the world’s longest rail line, which connects Duisburg and Hamburg to Wuhan, Chongqing and Harbin, and, as of mid-2016, Hamburg to the Chinese province of Hefei. 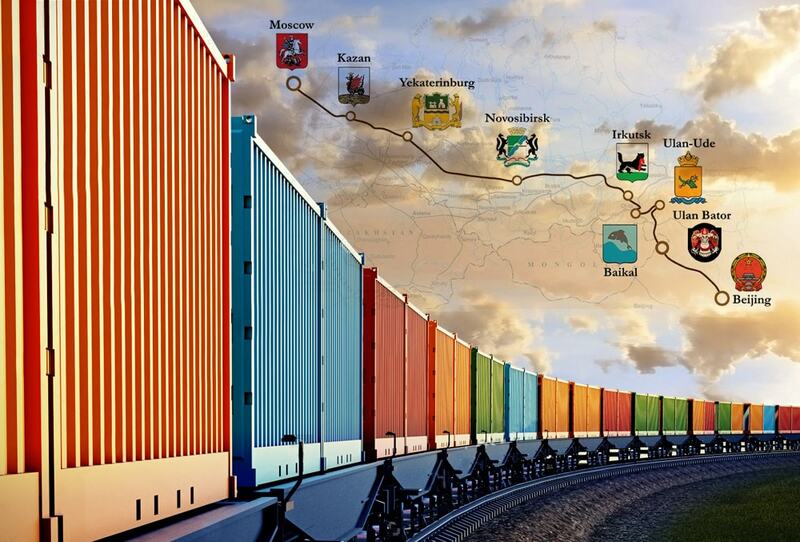 A record number of containers, around 40,000, were transported by train along the Silk Road in 2016. The volume is expected to increase to some 100,000 containers by 2020. “The 10,000-plus-kilometer journeys usually take 12 to 16 days and require containers to be unloaded and reloaded multiple times due to changes of gauge. The service is used in particular by customers with time-sensitive commodities, such as special promotional clothing items, and capital-intensive goods, such as automotive parts and electronics,” according to DB.